This guide covers advanced EHS features such as Kiosk Mode and EHS Logging. It assumes a working knowledge of Enterprise Home Screen and use of its Advanced Settings through direct manipulation of the enterprisehomescreen.xml config file. For those not familiar with these procedures, please refer to the About and Setup pages and the Advanced Settings Guide before continuing. Note: Many of the capabilities of EHS can be accomplished manually on the device, programmatically through EMDK or remotely using StageNow or a third-party Enterprise Mobile Management (EMM) system (if supported by that EMM system). EHS simply puts the capabilities into a single tool. Note: Secure Mode is discontinued in EHS 3.0 and higher. EHS 3.1 and higher supports Multi-user Mode on devices running Android 8.x Oreo and higher. The feature works through the concept of User Profiles, which allow for Primary, Secondary and Guest users, each with different sets of apps, capabilities and access privileges. In EHS, Multi-user Mode behaves as indicated below. Primary user - the first user added to a device and can be removed only by a factory reset. The Primary user is always running, even when a Secondary user is in the foreground. This user has privileges available to no others, including the ability to add Secondary users and access all device features and settings. Secondary user - any user that is not the Primary user. Secondary users can run in the background and continue to have network connectivity. Secondary users can remove their own account or have it removed by the Primary with no impact on other users. Guest user - a temporary Secondary user that can be quickly deleted (along with any data it created) when no longer needed. There can be only one Guest user on a device at a time. Also see Guest-user Behavior, below. The SD card slot is disabled when a device is in Multi-user Mode. Nothing can be saved to or read from an external SD card. The Primary user must be in the foreground on device when EHS is installed and first launched. Settings files for the Primary user deployed to a device apply to all users of that device. Settings changes made by the Primary user automatically apply to Secondary users. Secondary users are prohibited from reconfiguring device settings by any means (i.e. config-file push, EHS UI). Only Primary user can change app icon size. EHS config files pushed to a device are not consumed by a Secondary user; settings take effect when the Primary user comes to the foreground. Shortcuts pinned to the Primary user's home screen DO NOT appear in those of Secondary users or vice-versa. Only the Primary user has access to EHS Admin Mode. IMPORTANT: When switching from a Primary user in Admin Mode to a Secondary user, the Admin-mode timeout counter stops. In theory, this could allow a Secondary user to switch back to the Primary user and access the features of Admin Mode on the device. Camera- and Search-app icons (when enabled) do not always appear on the keyguard screen when switching between users until after a suspend/resume. When switching to a Guest user on a device, Android displays a prompt asking to select either "Start over" or "Continue." Start over - removes all app icons from the desktop and deletes data created by the previous Guest user. Continue - keeps app icons and DOES NOT delete data created during the previous guest session. Zebra recommends selecting "Continue" when working with EHS. Selecting "Start over" removes all apps (including EHS) from the Guest account. Note: There can be only one Guest user on a device at a time. On GMS devices running Android 8.x Oreo and higher, Zebra implements a feature called GMS Restricted Mode, an optional state that disables all GMS applications and services (i.e. Gmail, Google Maps, etc.) on the device (that are safe to disable) and removes their icons from the Android Launcher. Although these apps and services also are disabled on devices running EHS, their names remain visible in the EHS Preferences -> Disable Applications panel. Attempts to enable any of the effected apps–either through the EHS Preferences UI or by pushing a config file–result in failure and are added to the EHS log. 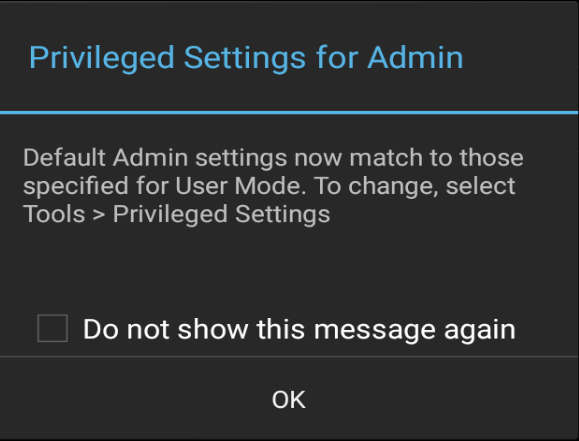 Users attempting to enable GMS apps through the Privileged Settings UI also see a failure message on the screen. Kiosk Mode is designed for devices to run a single application, often with a touch-based UI. Examples include retail price checkers, auto parts look-ups, patient check-in systems and so on. Kiosk Mode also can be useful when dedicating a device to a single user and/or task, such as a retail clerk's hand-held barcode scanner. Kiosk Mode places the app in full-screen mode and prevents the BACK and HOME keys from being used to exit the app by mapping those keys to the Kiosk app's most recent activity. Also see the EHS Auto-Launch feature, which provides functionality similar to Kiosk Mode without changing the HOME and BACK key functions. 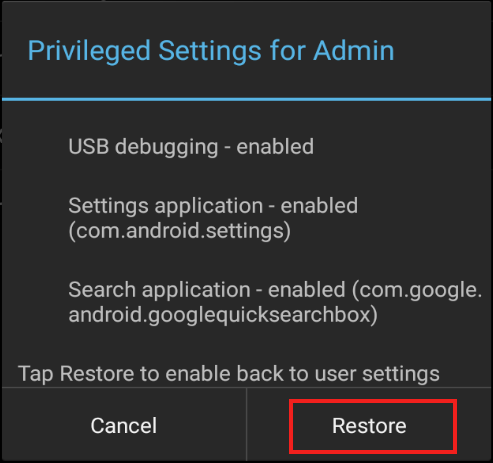 Most notably, activation of USB Debugging enables the Android Debug Bridge (adb) and its ability to transfer files to and from a device. 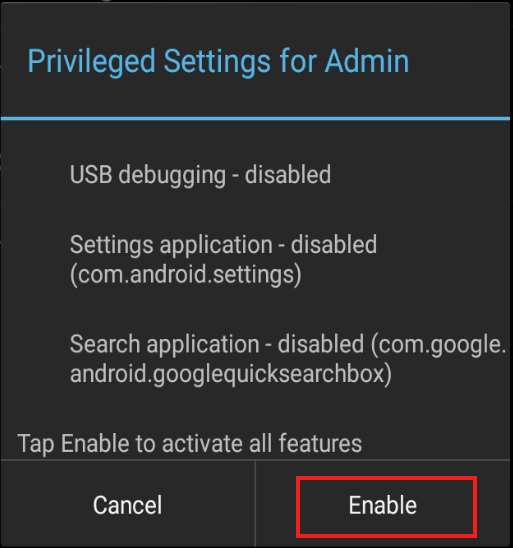 The Privileged Settings state on the device is indicated by a pop-up whenever the user enters Admin Mode: Tap "OK" to dismiss. 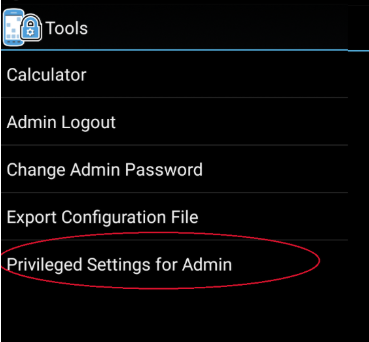 All three Privileged Settings are enabled as a group through an Admin-mode UI control and are disabled automatically when re-entering User Mode. The current state (disabled) is shown. Privileged Settings are enabled immediately. Tap "OK" to continue. The current state (enabled) is shown. Features are disabled immediately and a confirmation dialog appears. EHS records all major activities, failures and security events in the /enterprise/usr/enterprisehomescreen.log file. These include failed attempts to enter Admin Mode, switches of the operating mode and all EHS errors. The log is a plain text file and can be retrieved with ADB or an EMM and viewed with any text editor. Secondary user(s) - User_10, User_11, etc. For more information about logging, see Logging Preferences. In EHS 2.7 and higher, logging is disabled through the UI or config file. IMPORTANT: Secure Mode is discontinued in EHS 3.0 and higher. Log files are no longer designated as "SECURED" or "UNSECURED" in log entries. On Android Nougat devices, the Recent Apps button can be Enabled/Disabled. It is disabled by default to prevent the use of multi-window mode. Some devices retain the Recent Apps list after a reboot. Use App Manager through EMDK, StageNow or a third-party EMM system to clear the list. If using EHS with Zebra's MX Multi-user feature, it's important to enable the device Lock Screen. Failure to do so will prevent the MX multi-user login screen from being displayed. Use the DevAdmin features of Zebra's StageNow or EMDK tools to configure this setting. Taking a screenshot (by pressing the "volume-down" and "Power" buttons simultaneously) while in User Mode might expose users to the Gallery app or to apps used for sharing images such as Gmail and MMS. To prevent this, disable such unwanted apps in the Disable/Enable Applications section of Optional Feature Tags section. 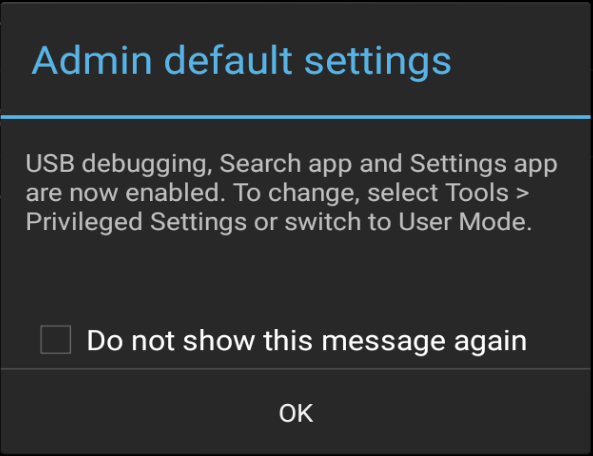 EHS by default disables the Settings app (com.android.settings) when the device is in User Mode. This prevents the "BT Pairing Utility" (accessible in User Mode) from enabling Bluetooth and pairing with devices. For organizations that wish to allow this capability, EHS offers a means of enabling Bluetooth control while restricting access to most other Settings panel features. Enable the Settings app using the Enable/Disable Apps feature. 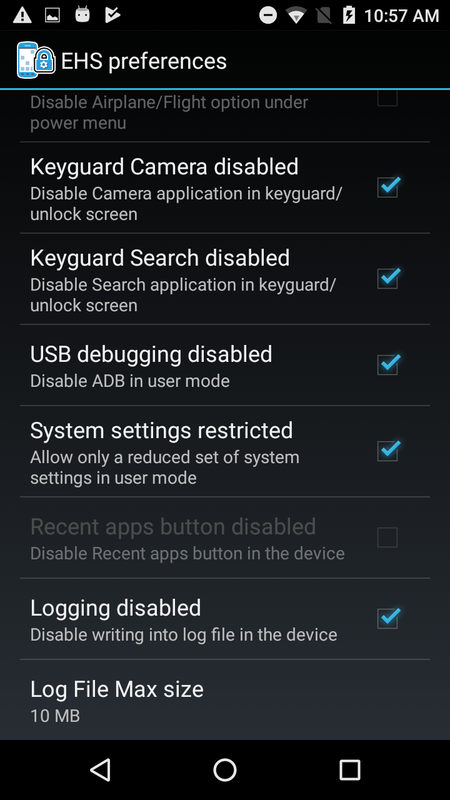 Enable the Restrict System Settings feature, which allows Bluetooth to be turned on and off while in User Mode. The BT Pairing Utility now works as expected. Note: The System Settings Restricted feature allows the device user to access Display and Sound settings and the "About device" screen.